So even though none of us will probably ever get the chance to taste this 64 year old Scotch in it's one-of-a-kind Lalique crystal decanter, that won't stop us from dreaming. The Macallan 64 Years Old in Lalique ($464,000 at auction in 2010) is the oldest of Macallan's single mault scotch whiskys ever to be sold and all the proceeds from the sale were donated to charity: water, which helps provide people in developing nations with safe drinking water. This rare Scotch was vatted from three sherry-seasoned Spanish oak casks — the ﬁrst was ﬁlled in 1942, the second in 1945, and the third in 1946 — and comes in a one-of-a-kind Lalique decanter. Named after the super treacherous strait formed by Washington Island, WI and the Door Peninsula, Death's Door Spirits ($30-$36) have both a literal and poetic connection to the location. The company's gin is made from organic wheat and wild juniper berries harvested from the island, while the vodka is made with an organic wheat grown only on Washington Island. Death's Door White Whisky is made from a mash with an 80:20 ratio of organic Washington Island Wheat and organic malted barley, double-distilled to 160 proof (! ), and finished in uncharred oak barrels to bring it together. Isn't it nice to know that on the day you become an octogenarian, you'll still be able to drink a scotch that's as old as you are? 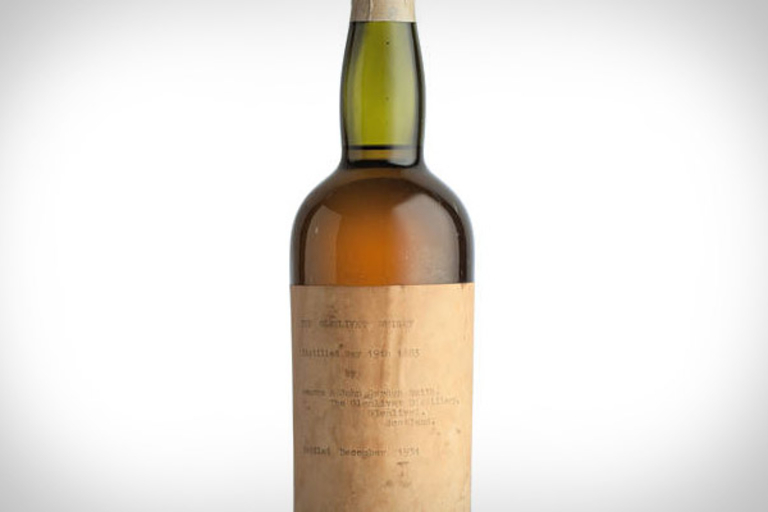 Distilled in 1883 and bottled in 1931, this incredibly rare bottle of The Glenlivet 80 Year Old Whisky (£15,000-£20,000; roughly $24,000-$32,000) was owned by Captain William Smith Grant — the great grandson of the distillery's founder, Colonel George Smith — and has been in the family ever since. Arriving in a fittingly modest bottle with matching label, it's just the thing to liven up the nursing home afterparty — or any party, for that matter. The trouble with buying high-end spirits is you rarely get a chance to sample them before you try. Master of Malt thought this was problematic as well, and created Drinks By The Dram (£2-£80; roughly $3-$130). These 3cl samples let you savor everything from somewhat common whiskeys, vodkas, and gins, all the way up to the £1530 a bottle Glenfarclas 1952 Family Cask. Just think of it as a pick-your-own spirit flight.